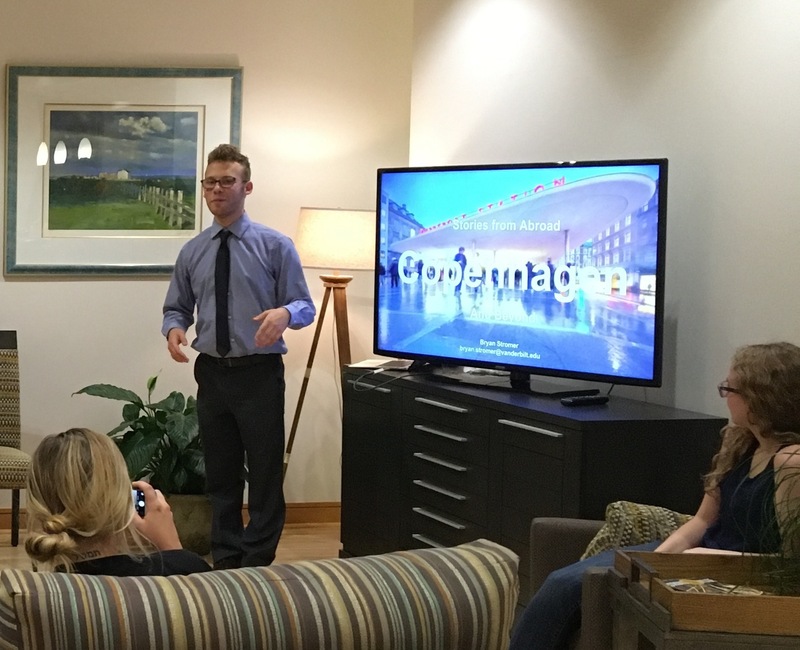 On September 14, Bryan Stromer joined us at Warren 503 to talk about his Study Abroad experience last year in Copenhagen. He brought two guests: Ruth Page, Program Coordinator from Vanderbilt’s Global Education Office, and Angela Best, Enrollment Services Manager at DIS – Study Abroad in Scandinavia. We enjoyed Bryan’s presentation on his study in Copenhagen, and I reminisced (mostly silently) on my own visits there in the past — clearly, we had been to many of the same places! I was interested to learn that Vanderbilt’s study abroad programs, of which there are many, are often organized by Vanderbilt partner organizations like DIS. DIS is somewhat unusual among these partners, in that it offers its own courses and student support, rather than solely organizing through traditional universities abroad. Bryan enjoyed his experience and the support he received from DIS and from Vanderbilt. 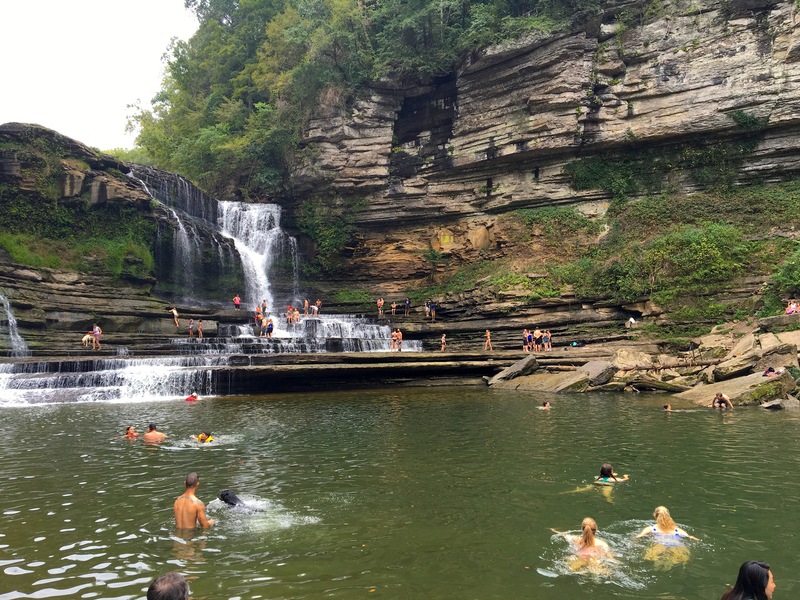 He was able to take courses that satisfied graduation requirements, including a lab course that he highlighted, and he was able to travel around Europe, meeting up with Vanderbilt friends who were studying elsewhere, and traveling with new friends. Ruth and Angela left some materials on study abroad, so if you come by for Fresh Baked Fridays, have a seat on our couch and look through it. While I have done assessments of study abroad courses in computer science previously as Director of Undergraduate Studies for Computer Science, Bryan’s presentation gave me a new appreciation and excitement for study abroad. Bryan’s presentation was the first of this year’s showcase of student expertise, experience, and expression (e³), which we began last semester. We’ll have more this year, and if you are interested in presenting to colleagues artistically, or on interesting educational and/or service experiences, let us know. We will set it up! 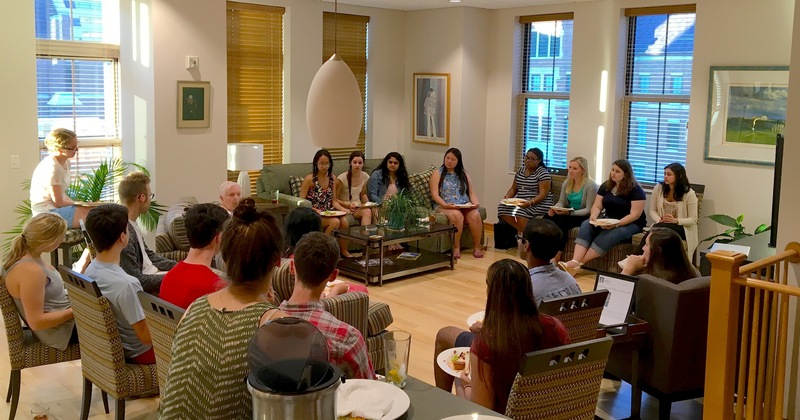 For the past three weekends our Faculty Director, Dr. Doug Fisher, has hosted community dinners in his apartment. 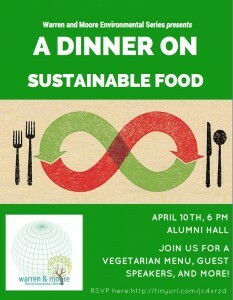 All students are welcome to attend and are met with good conversation, good food, and a special guest. On September 11th students were greeted with by a wagging tail rather than a handshake. Our special guest that week, Dr. Brenda Dew, brought along one of her retired service dogs, Charlie. Dr. Dew spear heads an organization called “Retrieving Independence” which trains dogs to become service animals. Charlie, a retriever lab mix, had previously worked with a diabetic patient. He had been trained, through scent, on how to sense a dip or spike in blood sugar and was equipped with skills such a food and juice retrieval to provide aid to his patient. Dr. Dew shared his story with us as well as many other touching stories that have resulted from the Retrieving Independence program (http://retrievingindependence.org/). We learned about Charlie’s brother, Rex, who has been working with his patient for years. His patient suffers from extreme seizures. Rex has been trained on how to roll the patient over following a seizure, how to retrieve help, and how to bring the patient’s wife the medications and tools she may need to assist her husband. According to the patient, Rex saves his life everyday. It is not just through medical service that these dogs provide aid. They are trained in a local prison by inmates. According to these individuals, these dogs have saved their lives as well. Dr. Dew read us a letter from an inmate who had trained a dog like Charlie. He explained that having this creature to be responsible for gave him great purpose. Additionally, he shared that these dogs have shown him what it means to selflessly love and care for another being. He explained that he regrets what he has taken from society but through this program he hopes to give back some good. These dogs are truly amazing and their stories are even more impressive. 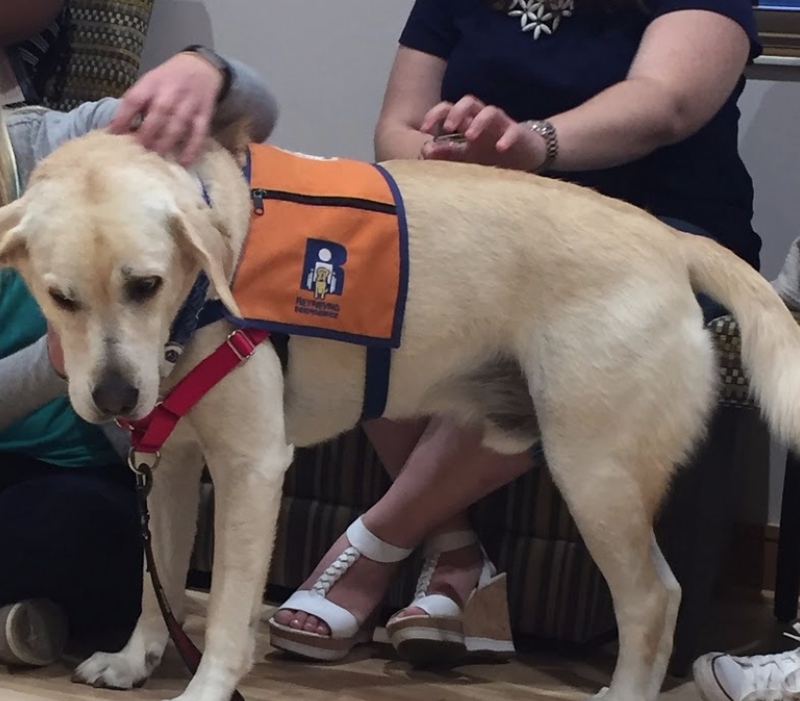 See below for pictures of our night with Charlie and Dr. Dew and click here if you would like to learn more about Retrieving Independence or donate to their great cause! 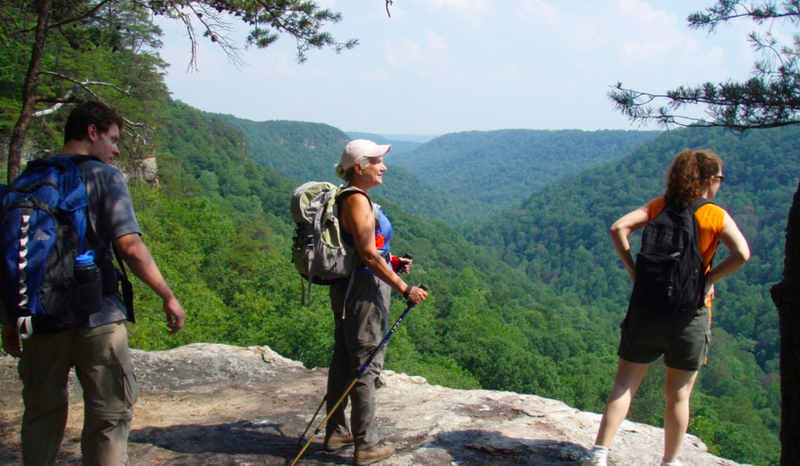 This blog post was written by L Hildner (the Graduate Fellow for Elliston Hall). She is a graduate student in Peabody College. The opinions expressed herein are L’s and are not necessarily those of Vanderbilt University. These words, spoken by Warren Faculty director Dr. Doug Fisher, embody the aim of the Warren and Moore Community. Whether it be in the faculty director apartment, the Kissam Center, or the common areas throughout the halls, the College Halls strive to create a sense of home and community. The Tour of Rooms began in the Warren Office Suite in order to introduce students to the offices of the Graduate Fellows and the Faculty Director. Attendees were met with a sampling of gourmet chocolate-covered pretzels. They were then given a cup to take around the tour to collect samples of unique chocolates stationed outside each participating room. These included mocha chocolate, chile chocolate, toffee chocolate, and more. The halls were filled with sounds of chatter and laughter and an overall sense of community. Two tour attendees were so impressed and excited that they decided to add their room to the tour spontaneously by opening their door and placing a bowl of Hershey’s Kisses outside of it. It was great to see such levels of participation, excitement, and warmth among the residents. The 2016-2017 academic year has started and our faculty and staff has been eager to get to know the residents of Warren College. With over three hundred residents living in Warren College this year there certainly are a lot of people to get to know, but that’s part of the fun of living here! In our first week, we have had several events to help our residents to get to know the Warren and Moore community. On move in Sunday a Welcome Back Warren open house was held in Dr. Fisher’s apartment. This was a chance for residents to stop in and say hello and check out the space where many more events will take place this year. Moore College has a similar event, organized by Dr. Lovensheimer and the Moore Graduate Fellows – Brooke and Valencia. Then, on Wednesday night we had a large scale event, an ‘orientation’ of sorts for the residents of both Warren and Moore Colleges. After the first day of class, the faculty and staff also felt that it was important for our residents to get a crash course in who we are. This was a chance for our residents to get a quick introduction to both faculty directors – Dr. Doug Fisher and Dr. Jim Lovensheimer; the four graduate fellows – Brooke, L, Laurel, and Valencia; the Area Coordinator, Courtney and the Graduate Area Coordinator, Chris; the College Halls admin assistant, Jordan; and the RAs. Residents were expected to attend one of the two thirty minute sessions. 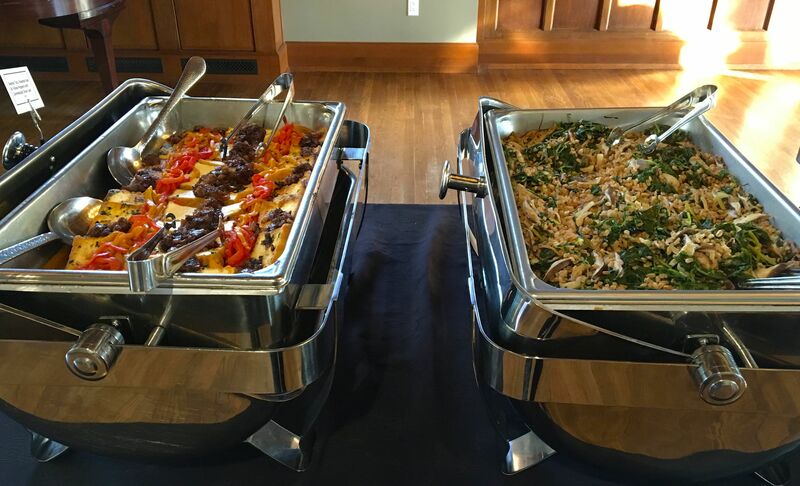 After the information session was over, students enjoyed a dessert spread provided by Vanderbilt Dining and mingled with their peers. Between Tuesday and Wednesday night, Dr. Fisher, L, and I also made our rounds to all of the floor meetings being held in Delbrück and Elliston Halls. This was our chance to interact with our residents in smaller settings and introduce them to what we do here in the College Halls system. With this opportunity we reminded our residents that we are here to help put on the programs that they want to see (and have the budget to help make that happen!). We hope that this is the start of a fantastic year with lots of resident participation in and interaction with the Warren community. The Warren Envoys program is intended to encourage Warren students to represent Warren in events across campus, typically events that the students would actively participate in anyways. The emphasis here is on “across campus” programs, as opposed to Warren-funded (or WAM-funded) within-Warren (or within WAM) programs. There are plenty of support opportunities already for this latter class of programs. include one or more Warren residents as members of the organizational team. By virtue of Warren’s contributions, Warren will ideally become a co-sponsor of any such event, whether it occurs in the WaM vicinity or not, and whether or not Warren residents are a majority presence in the organization of the event. Even if Warren residents are not initially involved overtly in organization, we hope that they would become so by bringing Warren support to an event. Why a Warren Envoys program, particularly when Warren (and Moore) residents, and many outside WaM, approach WaM leadership for co-sponsorship opportunities already? And we grant such co-sponsorship and will continue to do so. 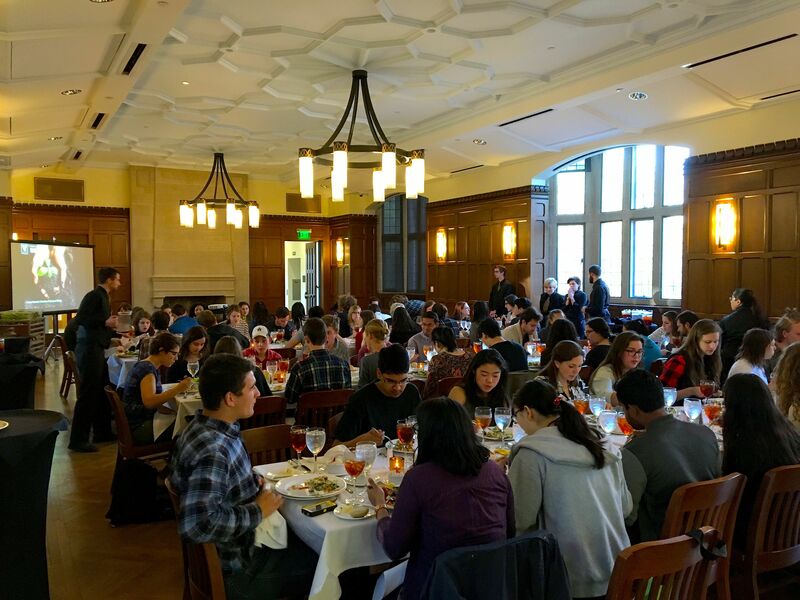 In part its about acknowledging, embracing, and leveraging the reality of student driven programming that is pervasive at Vanderbilt, as well as the wonderful fact that our students organize many of these activities! While numbers of participants at programs are not the whole story of evaluation by a long shot, it nonetheless appears to be the case that these “outside” programs draw more absolute numbers of Warren students than some within-Warren events. We don’t want Warren to compete with these other Warren-student organized events, or to have the appearance of competing with them. Rather, we want Warren to contribute to their success. By establishing Warren Envoys as a formal program, we hope to message to every Warren resident, particularly those not already plugged into Warren leadership, that Warren appreciates and supports outside-Warren programming, as well as inside-Warren programming, particularly when Warren students are active in the former. Ideally, Warren Envoys will help create a Warren identity among participants in what would have been non-Warren programs, and increase Warren participation in the program through social networking and increased promotion. Early in WaM’s life, it is, perhaps, not surprising that we were hyper-focused on building community within Warren and within WaM. Much of this inward focus can, will, and should remain (e.g., Warren e³, Moore’s Coffee and Conversations, Warren Film Series, game nights), but as I have reconnected with my Faculty-member-in-residence roots (i.e., at McGill, old Kissam, “old” North), where a residential faculty member is an ambassador of the entire faculty to the entire residential life of campus (as I defined it anyways), I’m committing more of my time of late to attending events across campus. And guess what I have seen first hand, which I only knew abstractly and didn’t grok before? There are tons of Warren and WaM students doing an extraordinary amount of planning and implementing of programs across this campus, “outside” of WaM. And when I go to their events, I feel good about supporting them! In addition to Warren resident participation of events I wrote of earlier, over 50 students attended Hidden Dores Miniweek on March 29, with a majority of the speakers being Warren residents, as well as the moderator/organizer; I counted about 10 Warren students (of about 100-150 attendees) at the Climate Connection on March 29, entitled Black Lives Matter and Saving the Planet; and I counted another 14 Warren residents and alums (of almost 100 students) at VSW on April 1. As a computer scientist, I am inclined to want to understand the dynamics of residential life holistically and beyond the anecdotal. We want to capture both the outward-Warren facing programs by our residents, who view Warren as a place to reenergize, and inward-Warren facing programs that help build a community capable of reenergizing its residents. Some of our residents are, no doubt, primarily outward facing, some primarily inward facing, but all are to varying extents between these. To help quantitatively characterize the outward-facing programming of Warren students, I’ll ask those who participate in Warren Envoys to give an exact (through swipes) or approximate (through head counting, as I do) number of Warren attendees at these programs — no names, just numbers! Eventually, if we really want to maximize the number of students who are served, we will want to know who participates in outward facing programs, who participates in inward facing programs, and who is falling through the cracks. Because we are rapidly approaching the end of the year, and our available budget is dwindling, this is likely a program that we won’t start up formally until next year, though I can point to examples where it is already happening at WaM, albeit ad hoc by those who are plugged into WaM leadership. We can do it better. For example, in the past we have, as a matter of policy, not promulgated non-WaM events in our newsletters and over our list serves. I expect the policy to remain the same, but under Warren Envoys, so much more will open up as Warren programming! Doug Fisher is Faculty Director of Warren College. This post reflects Doug’s opinions and not necessarily those of Vanderbilt University. Thanks to Nick Dressler and Grace Chee for discussing this with me and helping me to refine the ideas. 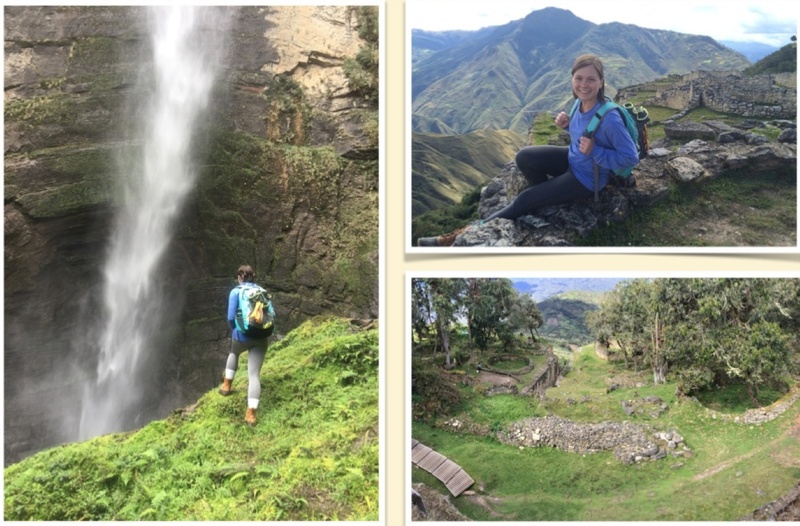 Just after Spring break, Victoria Scott of Warren College gave a wonderful presentation on her internship and travel in Peru last summer (posted with permission). Her slideshow sparked uuhs and ahhs, and lots of Q&A at Warren 503. Campus Dining brought in snacks, which we all enjoyed. 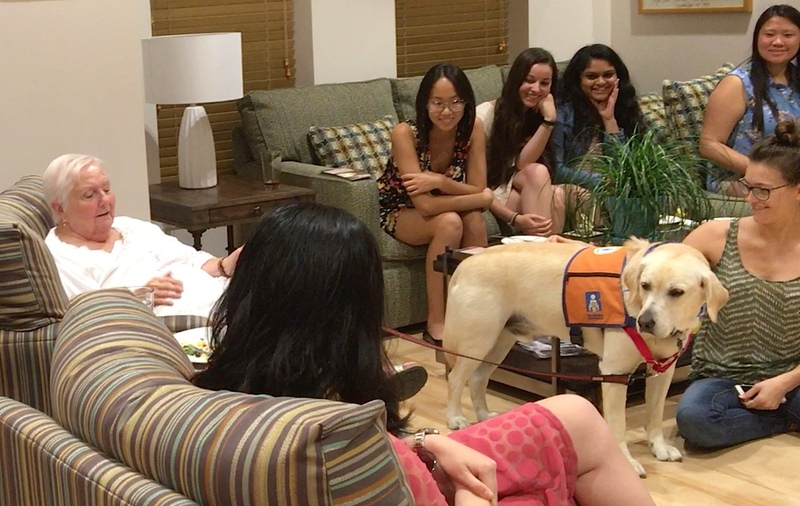 Our evening on Peru was the first in a series of gatherings that highlight student expertise, experience, and expression (e³). These showcases can be on professional or leisure/travel topics, which Victoria’s presentation combined so well, or be academic and artistic in nature, to include performance art, practice conference talks, and formats I might not imagine yet. The common threads are the focus on individual student e³, perhaps with very occasional small groups, and the informal atmosphere that seems to come naturally in the cozy but open Warren College faculty apartment. The focus on individual students addresses a niche that I have not seen elsewhere, and I believe it complements existing programming formats around campus. This series didn’t emerge from nowhere. There is the backdrop of ubiquitous student driven expression across campus, which professional staff, me included, have little to do with. Professor Lovensheimer’s Concerts at Kissam regularly features student talent. Moore Student Governance organized a panel on internships last year, composed exclusively of students with internship experience. The Warren RAs held a similar event this semester. Patricia and Riley, one of our RAs, imagined a student showcase series like this, again with an emphasis on featuring individual students, which Patricia shared with me. I asked Victoria to do this inaugural showcase when I talked to her at the Warren RA internship event and saw some of her pics from her Peru trip. I talked to Grace and Nick about it, they loved the idea, and we set it up. And we will certainly ask others. But students who want to talk about their experience or to act on their talent at Warren 503 should talk to me or the graduate fellows about it. We’ll set it up, open the apartment, and promote it along with you. Nick, Grace, and I have wondered about a name for this series (Warren Student Showcase? Warren e³? ), and we are open to suggestions. Whatever the name turns out to be, thanks to Victoria for being our inaugural anchor. On Friday night (2/19) I went to The Poets’ Choice Awards by Vanderbilt Spoken Word at the Sarratt Cinema. It was awesome. There were over 200 people in the audience, largely students, with some family and faculty/staff too. The program shows about 50 individual performers and support staff, to include the two special guest groups (Nach Vandy and Harmonic Notion). That is over 250 total participants! And I am not counting those who attended Saturday night’s encore performance, nor the distinct special guest groups (The Original Cast and Tongue N’ Cheek) appearing on Saturday’s bill. I am assuming that some people attended both nights (it was worth it). 500 individuals over both nights is probably a good estimate of the number of participants. And on Friday and Saturday nights! That is remarkable. The Poets’ Choice Awards is student-driven programming in its purest and most successful form. It draws on students from across campus (e.g., 6 performers were from Warren College, one Warren/Vanderbilt alum, and one of my database students), and diverse in gender and race. The event required a significant investment of time, brains, heart, and sweat for composition, planning, and execution. The pieces were so well written, addressing important issues of sexual assault, personal identity, mental health, to name a few. The audience was attentive and boisterous, creating a kind of dialog that was gratifying and fun. The event drew in faculty, staff, alums, and family, as well as students. Professor Lori Troxel, a WaM faculty associate, and her husband sat in front of me. This is the kind of program I dream about. There are plenty of other student-driven programs on campus, like Diwali, Original Cast Fall and Spring shows, hackathons (e.g., Vandy Hacks and Hack Vandy), and so many more. The Meladores are a student organization with events that have gone viral and international. There are some who might not label the activities above as “programs”, but they are (and ideal programs at that), particularly when Vanderbilt funds and other resources are used. While many of these groups benefit from well-placed faculty/staff advice and support, the programs may hide in plain sight when we have our “programming glasses on” because they include little staff and faculty involvement beyond advice and signatures. As the saying goes, sometimes the most important thing one can do is to stay out of someone else’s way. The most important thing that I do relative to student-driven programs is that I go to them. As a former faculty member in residence at McGill, old Kissam, and North, I regarded my primary obligation to be “showing up” at student driven events like the McGill Hours and Coffee Houses, SPEAR meetings, NAACP panels, and student religious group gatherings and worship at St Augustine’s; as well as institutionally-sponsored events like those by the Women’s Center, Office of Alcohol, Tobacco & Other Drugs, the Chaplain’s Office, Outdoor Recreation, and Residential Education. 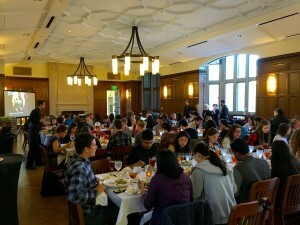 I’ve experienced that student-driven programming is pervasive at Vanderbilt for a long time, and I want to make a formal census of the many exemplars of student-driven programming and dig into their origins, which will give those of us that worry about programming a back drop against which to frame everything else we do. Now that I am a Faculty Director, being an ambassador of the faculty to the after hours of Vanderbilt’s residential life — be it at The Ingram Commons, McGill, Moore College, Furman, Stevenson, or Sarratt — is only one of my obligations. My primary obligation is to be a community facilitator and lead at Warren and WaM, working with the Graduate Fellows, the Warren Council, Patricia, the Area Coordinator, and RAs. The latter role of facilitator, as I see it, is many fold. First, our role to foster a safe and reenergizing residential community — a “home”, albeit different from the traditional home, with Fresh Baked Fridays being an example of a program intended to foster that. Second, the FDs and GFs take on ventures that require considerable funds and/or a commitment to the long haul. Professor Lovensheimer’s Concerts at Kissam are a good example. While initial attendance in year one was often small, its been growing thanks to a Faculty Director’s commitment and patience that allows it to grow. The concerts are also considerably responsible for WaM getting more Blair students, despite the long distance to Blair. 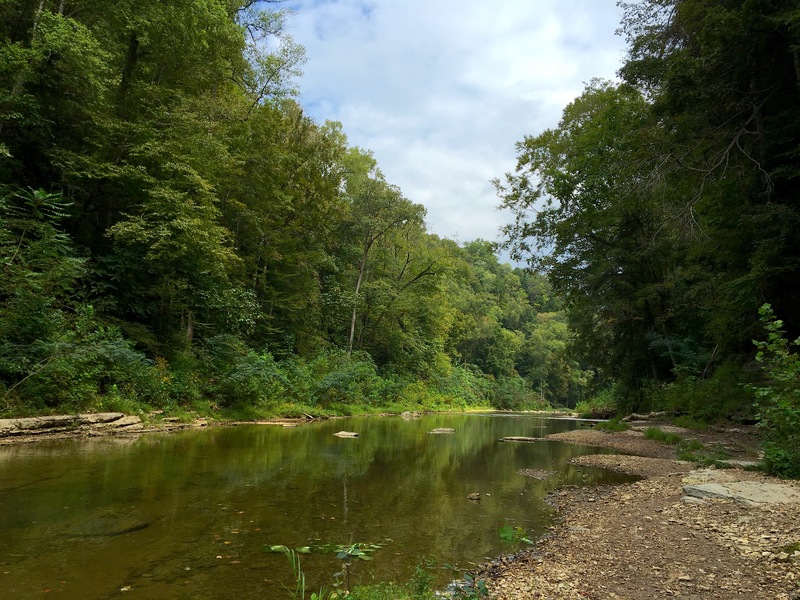 The WaM environmental series is another example, and we’ll exhibit long-term patience with that too, because we believe that WaM should always have environmental programming — sustainability should be in our bedrock. 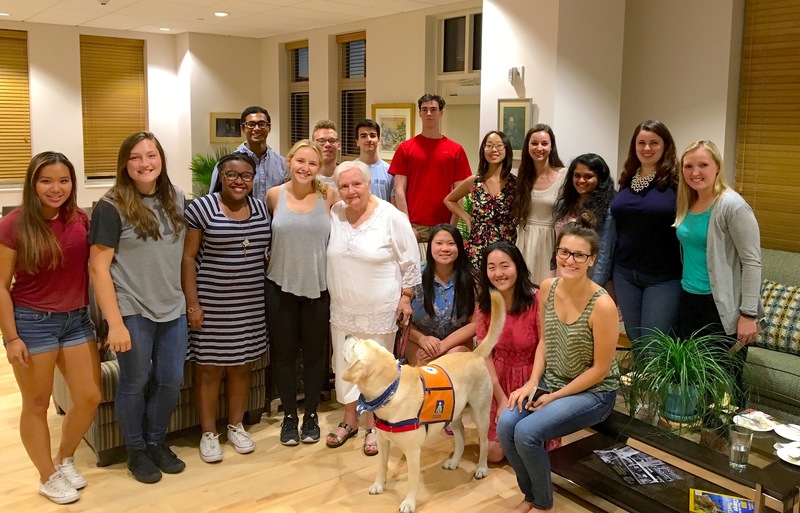 Third, FD and GF programs introduce students to faculty and staff community members, including the Chancellor and Provost, who our students might not otherwise be able to meet and speak with. Dinners at the faculty apartments, Moore’s Coffee and Conversations, and Warren’s Fireside Chats are examples of these. 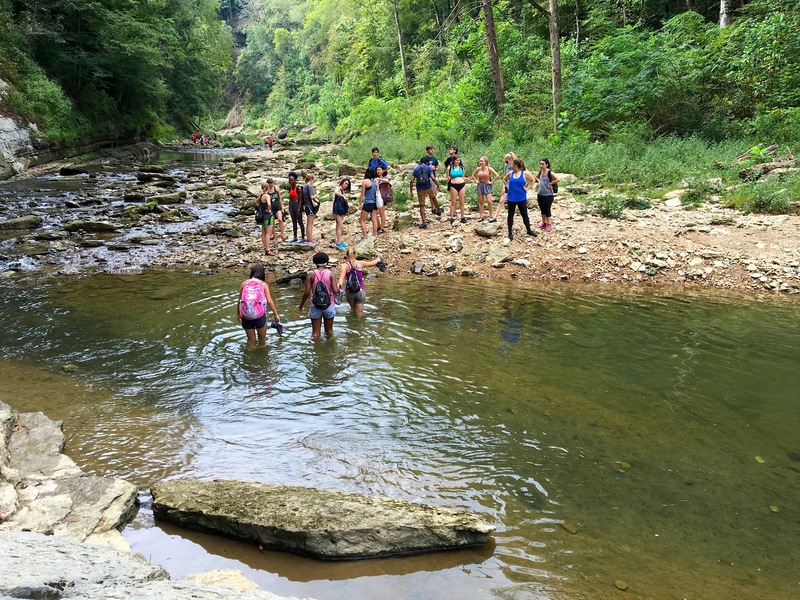 Fourth, while there is already awesome student-driven programming across Vanderbilt, we are exploring mechanisms for facilitating still more of it within Warren and WaM, albeit in ways that complement what is already pervasive across campus. How do we facilitate still more student-driven programming without interfering with what is not broken? Again, our approach is “in house” and we hope to appeal to those students not previously involved in program planning, or have a break in other programming that they are involved with. We give the Warren Council a budget to use, and they tap into the mood of the students in defining and timing events. Student committees help plan programs like Hot Topics and The Warren Film Series with the Graduate Fellows. We are also creating new initiatives that invite Warren students to lead discussions at Warren 503. On March 17, we have our first student guest presenter, who will be doing a slide show on her experience in Peru on a summer internship at hospitals and traveling the countryside. We also are inviting students to host their invited guests in 503. 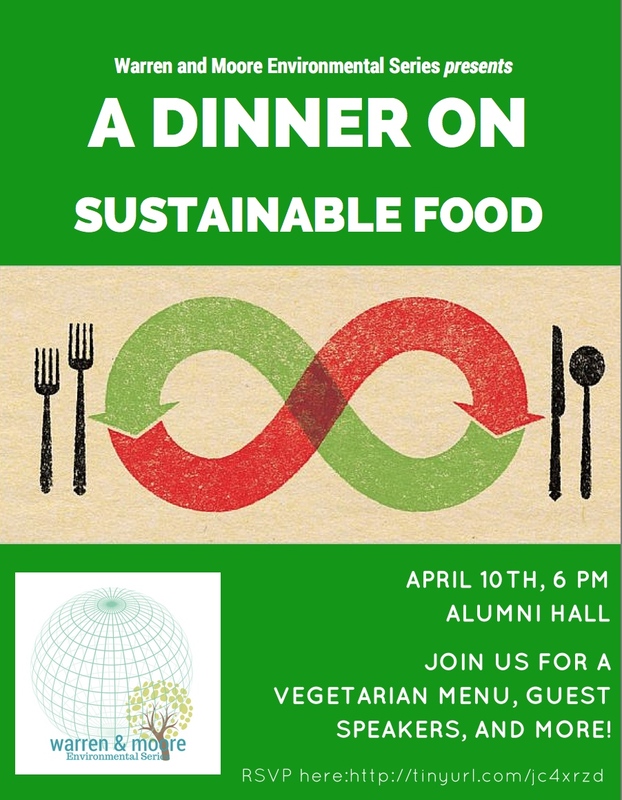 This opportunity grew from suggestions at the Senior Alumni Hall dinner by a few seniors who wanted to host employees from The Market and The Kitchen, for dinner and to hear their stories. In truth, all these mechanisms, and more, for facilitating student-driven programming at Warren and WaM exist now, and can be exercised by knocking on the Faculty Director doors and/or the Graduate Fellows doors. Some of what I have just described are ways of scaffolding this entry for students, but even those scaffolds often develop as the result of student ideas. Much of what emerges in the way of Warren and WaM student driven programming may be small compared to The Poet’s Choice Awards and other across campus student collective efforts, but that’s great, because the last thing that I want to do is to compete with larger student run programs. We hope to complement the larger efforts too, in opening opportunities for other students to lead and plan events with nuanced themes that appeal to smaller groups. All good.